How can I root OnePlus 5 Device? OnePlus is one of the best smartphones in the world and OnePlus 5 is their latest model. OnePlus 5 got huge attention in tech communities and it is officially launched on June 20. The device priced RS 32999 and awarded the best device available at this price currently.Sorry, we are not discussing the features or other specs of OnePlus 5 in this article. here I am showing you how to root OnePlus 5 android device and install TWRP recovery on it. Hope you guys already knew about what is rooting and it’s advantages. Anyway, for formality, let me tell you that rooting is the process of getting root access to your Android OS completely.The main advantage of rooting is that you can install Root access needed apps and also you can uninstall system apps from your device. get ready to Root OnePlus 5 device. So guys let me move to the Rooting section of OnePlus 5. Unlocking Bootloader: To root your device it is very important to unlock your bootloader. After unlocking the bootloader you can root your device also you will be able to install custom ROM on your device. Install TWRP Recovery: Yeah in this article as I said in the introduction we are installing TWRP recovery. There are lots of Recovery tools [like CWM] are available, but for rooting OnePlus 5 here we are using TWRP recovery. It’s one popular and useful recovery tool. Rooting: After installing TWRP recovery tool you can simply root your device with Super Su. Hope you understand some basics of OnePlus 5 rooting. don’t worry there are no much hard steps. It is not hard as it sounds. Do follow below steps carefully and root OnePlus 5 easily. Do enable Developer option in your OnePlus 5 device. after that, turn off your OnePlus 5 device. Now press both the power button and volume up key simultaneously for 10-15 seconds. Yeah, now you will be in fastboot mode. Okay, now connect your OnePlus 5 to PC using USB cable. Hope you downloaded and extracted the files downloaded in the requirements section. Open the ADB drivers folder and press the “Shift button + Mouse right click” and then click on Open Command Window here. Enter below command to install TWRP recovery on your OnePlus 5 [refer the images for more clarification. make sure that you are at the correct location]. Yo. Now your device will be booted in TWRP recovery mode. You need to swipe there to go to TWRP menu. Do tick mark on the ‘never show this screen’ and swipe it. Then boot your device to recovery mode. Now on TWRP recovery click on install. then select SuperSu zip file from the internal memory location. Here too you need to swipe the scroller at the bottom to confirm the flash option. Guys, hope you completed the 3 sections successfully. 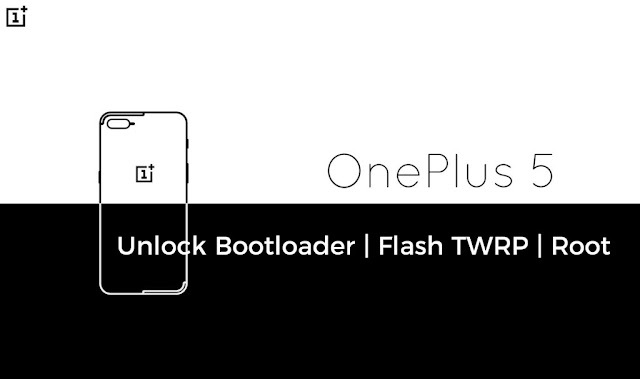 SO, guys, that’s all about OnePlus 5 rooting and installing TWRP recovery tutorial. If you liked this tutorial then please do share with your friends. also, keep visiting techintor.com for more tech tricks and news.